In the hope that readers might enjoy some additional information about Eleanor “Nelly” Parke Custis, herewith the following. A family portrait with Eleanor and her brother George Washington Parke Custis on the left. Since Nelly was raised at Mount Vernon she knew her step grandfather’s habits firsthand. He rose before sunrise, always wrote or read until 7 in summer or half past seven in winter. His breakfast was then ready—he ate three small mush cakes (Indian meal) swimming in butter and honey, and drank three cups of tea without cream. Dubbed “hoecakes,” the Indian meal pancakes were so named because they were made on a griddle or hoe. Nelly even included the recipe in a letter she wrote. A modern adaptation of this recipe can be found here. When my Harpsichord comes, I shall practice a great deal, & and make my Sister sing your parts of our Duetts. I think you had better come here to sing them with me. I do not despair of seeing you, & I shall be very much disappointed if you do not visit us. When Nelly married Lawrence Lewis, Washington gave the couple some property on the grounds of Mount Vernon on which their home Woodlawn was built. Expanded to more than 2,000 acres, the plantation at one point had 100 workers of whom at least 90 were slaves. In 1952, the house and 126 acres became the first historic site owned by the National Trust. Washington at Home lithograph, 1867, engraved by Henry Bryan after painting by Alonzo Chappel in the George Washington Collection of Washington College; recipe and photograph for hoecakes is at Mount Vernon; Nelly Custis’s harpsichord can be seen at Mount Vernon; the photograph of Woodlawn can be found here. Sarah Jay in Paris, where her husband was one of the commissioners negotiating the peace treaty with the British, reported in a letter to her sister, that she had tea with the children of financier Robert and Mary Morris. The boys had been sent abroad to be educated, and Sarah kept an eye on them; “whiggs” were served. Present my Compts. to Mrs. Morris. … I’m sure she’ll envy me the pleasure I’m to have this afternoon, when I tell you that her little sons are to drink tea & eat whiggs* with me. Mr. Jay joins with me in love to our little boy & our friends. Adieu my dearest sister. According to the Oxford English Dictionary, a “whig” or “wig” is a “wedge or wedge-shaped cake. A kind of bun or small cake made of fine flour. Wigs [are made] with as little flour as possible. … Split and butter them while hot.” You might want to try this recipe. My colleague, Louise North, bakes them, and we have served them at readings, where they are a hit. Scald the milk and add butter, sugar, and salt, and when cooled to blood heat [the temperature of the blood vessel on the inside of your wrist], add the yeast cake, which has been dissolved in 1/3 cup lukewarm water. Beat the eggs until very light; add them to the milk and the spices, and sift in enough flour to make a stiff dough. Knead well and set to rise overnight in a covered bowl. In the morning roll out on a floured board to 3/4-inch thickness; cut with a biscuit-cutter; put in a baking pan, or in muffin pans, and set to rise in a warm place for 2 hours. Bake in a hot oven [375°] until brown. Mitchell, Patricia B. At the Table in Colonial America. Chatham, VA: Sims-Mitchell House Bed & Breakfast, 1994, page 9. This recipe was originally taken from The National Cookbook: A Kitchen Americana by Sheila Hibben, New York: Harper & Brothers Publishers, 1932, page 6. The excerpted letter is from Selected Letters of John Jay and Sarah Livingston, compiled and edited by Landa M. Freeman, Louise V. North, and Janet M. Wedge, published in 2005 by MacFarland & Company, page 134. 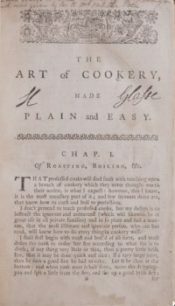 Harriot Pinckney Horry began a “receipt” or recipe book in 1770 two years after her marriage. Hers was a well-to-do South Carolina family with an extensive vegetable garden, farm animals, a dairy … and slaves. Naturally much attention was paid to preserving food, especially meat: salting, drying, and smoking were among the methods in common use. “Potting” was another. This method called for meat to be cooked until very well done and then, using a mortar and pestle, made into a paste to which herbs or spices could be added. The mixture was packed into crocks and covered with fat to keep it from decomposing. It was eaten spread on bread or toast. Potted meats are still around today—think Spam, or canned pet food! The following receipt is one of her mother’s that Harriot included in her book. Cut Eight Pound of Lean Beef out of the Buttock or any other lean peice into Pound Peices, take six Ozs. salt Peter, half a pint of Peter Salt and as much Common salt and rub the meat well with it and let it lie three or four days, then put it into a stone jarr and cover it with some of its own Brine and Pump Water and bake it, then Pick all the fatt and Skins from it and pound it very fine in a Marble Mortar; as you pound it pour in melted Butter enough to make it very moist, like paste. Add peper and salt to Your tast, and season it high with Spices. Then press it down in your Pot, and cover it with Clarified Butter or Mutton Suet. This excerpt is from In the Words of Women, Chapter 8, page 228.